(Nanowerk News) Scientists at the Department of Microsystems Engineering (IMTEK) and the Freiburg Materials Research Center (FMF) have succeeded in developing a method for treating the surface of nanoparticles which greatly improves the efficiency of organic solar cells. 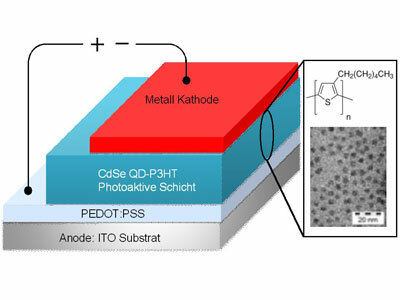 The researchers were able to attain an efficiency of 2 percent by using so-called quantum dots composed of cadmium selenide. These measurements, well above the previous efficiency ratings of 1 to 1.8 percent, were confirmed by the „Dye and Organic Solar Cells“ research group of the Fraunhofer Institute for Solar Energy Systems at the FMF. The photoactive layer of hybrid solar cells consists of a mixture of inorganic nanoparticles and an organic polymer. As it is theoretically possible to apply the method developed by the researchers to many nanoparticles, this breakthrough opens up new potential for increasing the efficiency of this type of solar cell even further. The procedure has been patented and the results were published in a recent issue of the renowned journal Applied Physics Letters. Organic solar cells belong to the so-called third generation of solar cells and are still in the developmental stage. The world record for purely organic solar cells, a type in which both components of the photoactive layer consist of organic materials, is currently at 7 percent for layers created through wet chemical methods. Organic solar cells have many advantages over the conventional silicon cells typically used for large-scale energy production: Not only are they are considerably thinner and more flexible, they are also less expensive and quicker to produce. They are thus better suited for powering everyday devices and systems which are not in constant use, such as sensors or electrical appliances. In the long run, organic solar cells could drastically reduce our dependence on batteries and cables. The research group which developed the groundbreaking new solar cells is a close-knit team of chemists, physicists, and engineers from IMTEK and FMF. „The interdisciplinary orientation of the group is a clear advantage and has led to rapid progress on the project. We were able to carry out all of the steps on our own: from the synthesis of the nanoparticles to the modification of their surface and integration into composite materials,“ says group head Dr. Michael Krüger. His „Nanosciences“ research group is part of the Chair for Sensors at IMTEK held by Prof. Dr. Gerald Urban. The group is now applying the methods described in the publication to other promising materials systems – also as part of a joint research project sponsored by the German Federal Ministry of Education and Research – in order to refine them further and shape them into a market-ready technology. The necessary preconditions for marketability are marked improvements in efficiency, a further increase in the durability of the materials, and a reduction in production costs.